Yarmouk Valley: The Formation of Jaysh Khalid ibn al-Waleed? The ongoing fighting in the Yarmouk Valley in southwest Deraa on the border with the Golan Heights between Liwa Shuhada' al-Yarmouk (LSY) and Harakat al-Muthanna al-Islamiya (HMI) on one side versus southern FSA factions and the southern Jaysh al-Fatah on the other is more or less at a stalemate. While the latter have succeeded in reversing the gains of LSY and HMI, pushing deeper into the Yarmouk Valley has proven more difficult but life has become increasingly difficult for Yarmouk Valley residents with rebel bombardment and price hikes through siege conditions. Until now, there has also been the question of why LSY and HMI have not formally united. A statement declaring a merger of HMI under LSY last month turned out to be fake. I myself have speculated that this may be because HMI has wanted to preserve an identity independent of LSY, which is clearly linked to the Islamic State (IS) and has undoubtedly tried to pull HMI into its orbit. "When the Romans [Byzantines] attacked the army of the Muslims in Tel al-Jabiya, the army withdrew and reconcentrated itself in the Yarmouk Valley and Khalid ibn al-Waleed- may God be pleased with him- took over the leadership of the army of the Muslims after the withdrawal of Abu Obeida ibn al-Jarah, and the army of the Muslims was less than 35000 fighters while the Romans more than 240,000 so there was the battle of Yarmouk in which God gave victory to His Muslim servants over the land of al-Sham entirely. How similar today is to yesterday...in the names, numbers and land of battle, and rejoice with the conquest itself by God's permission, rejoice for the men of Khalid ibn al-Waleed are here, rejoice for the men have sold their dunya and purchased the contentment of God, rejoice for the army of Khalid ibn al-Waleed has returned: the army of Khalid ibn al-Waleed has returned." "Ummah of Islam, good tidings, for indeed we notice a dawn in youth who have built up a most great awakening for the religion. The army of Khalid ibn al-Waleed." Beginning from God Almighty's words: "Indeed God loves those who fight in His path in one rank as though they were a structured edifice." And His words: "And cling to God's rope entirely and do not separate, and remember God's blessing upon you, when you were enemies but He gathered your hearts together and you became brothers by His blessing, and you were on the edge of the pit of Hellfire but He saved you from it and likewise God makes clear to you His signs, perhaps you will be guided." 1. The formations present in the Yarmouk Valley have been restructured under the name of the army of Khalid ibn al-Waleed. 2. The name of base 105 has been changed to al-Andalus and base 106 has been cancelled for good. 3. The responsibility of internal security (al-Andalus) has been defined as resisting attempts at treachery and betrayal from the treacherous hands of the apostates and the basis of operation of internal security will be from the Shari'i court by God's permission. The statement itself raises some questions because until now it has not been featured on LSY or HMI's official media channels. Rather it has so far only been put up on fake/unofficial accounts. However, two LSY members earlier today affirmed to me that the statement is authentic, while Omar Mardini told me he could not determine the statement's authenticity: "No new statement for distribution has reached us [i.e. the media office] and the matter may only be a suggestion until now." Even so, posts subsequently put up by Omar Mardini on his page speak of the end of HMI and LSY as distinct names and deride the idea that one should feel sad at their loss. This confirms that at least some kind of merger under the moniker of Jaysh Khalid ibn al-Waleed is happening. Furthermore, one of HMI's official pages affirmed the merger about an hour ago. It may thus be that the above document is a prematurely released rough draft of the merger. So what is going on here? It would appear that IS is making an attempt to reorganize and revitalize the southern front against rebel factions following the failure of the first offensive that began in March 2016 and was preceded by the surprise appointment of a Saudi known as Abu Abdullah al-Madani as amir of LSY. As I explained at the time, he was sent by IS to take over LSY partly because Abu Obeida Qahtan was not successful in administration, and it is clear IS was gearing up to activate the southern front with a new offensive. In this case, IS has now dispatched another amir to head Jaysh Khalid ibn al-Waleed, something confirmed by the two LSY members who declared the above statement to be authentic as they affirmed he had come from IS territory. This line of analysis is also corroborated by sources speaking to Step News Agency, which gives the new amir's name as Abu Othman al-Idlibi (one of the LSY members though says that the name of this amir is Abu Hashim al-Shami as per the document, but it could be two kunyas for the same person). In any case there is no dispute of the IS role in sending this new amir to reorganize things. Step News Agency also makes an interesting claim that would seem to corroborate my previous consideration of the existence of HMI resistance to merging with LSY. Namely, one of HMI's official channels recently reported the death of one Abu Omar Sawa'iq, killed by an IED in his home by mistake. Step News Agency notes he was the number two man in HMI after Abu Ayyub al-Masalama but had resisted the idea of merging with LSY. With his death and HMI's dependence on LSY for survival, it seems that no further impulse remains to retain an independent identity. Can Jaysh Khalid ibn al-Waleed achieve much? As the name suggests, the historical precedent is based on the idea of being vastly outnumbered by the enemy. IS knows the southern front is in a bad situation and seems to be trying to reinvigorate the momentum in favour of its allies. However, the most reasonable assessment will conclude that Jaysh Khalid ibn al-Waleed will get no further than its predecessors in the fight against the rebels. 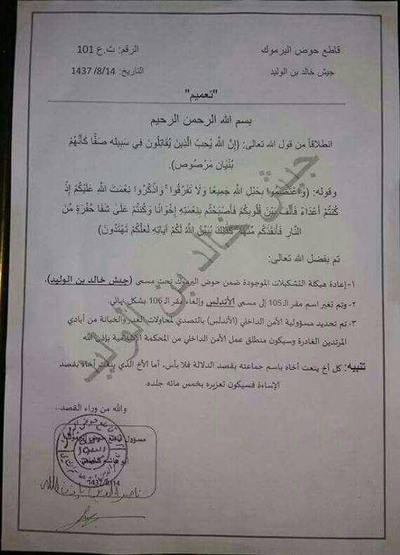 Update (25 May 2016): Abu al-Waleed al-Baridi, who has served as a deputy amir of Hisba for LSY, in a message to me today says the document above declaring the formation of Jaysh Khalid ibn al-Waleed is authentic, and says the amir for Jaysh Khalid ibn al-Waleed is Abu Hashim al-Hamawi (admittedly, the name signed to the document is very unclear as it is obscured by the poor photo quality and stamp). He also affirms that this amir is a new arrival. Again, this points to a dispatch by IS.